Porsche might not be attending this year’s North American International Auto Show (NAIAS) in Detroit, but it hasn’t stopped the company from launching new cars into the already crowded 911 range with the 2017 GTS. Historically the GTS has represented the ultimate in 911 performance without having to go for the Turbo or one of the more track-focused, exclusive and limited production RS or GT3 models. And while this is still the case, thanks to increasingly strict regulations concerning emissions and fuel economy, the 2017 GTS will be the first ever to come with a turbocharged engine in order to meet environmental demands. 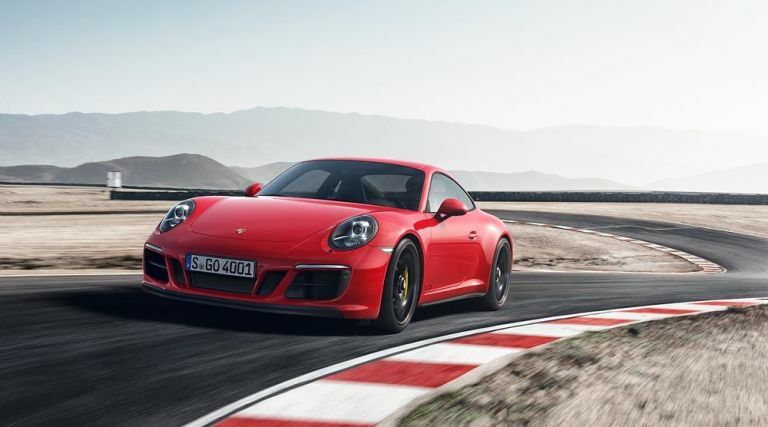 The turbocharger in question is all-new even if the 3-litre flat six engine it’s mated to is the same as that in the current generation 911 Carrera, but the resulting power increase will leave the Carrera and the current generation GTS standing. The new GTS outputs 444bhp and, depending on which model (there will be five variants to choose from), a 0-100km/h time of 3.6 seconds. All models will be capable of hitting 300km/h flat out. Just as impressive are the fuel economy figures. Despite the extra power, the new GTS in hardtop, two-wheel drive configuration is good for 8.3l/100km. Even the four-wheel-drive Cabriolet achieves between 9.7-8.7l/100km. As well as new engine technology, the new cars get a host of tweaks inside and out. There’s a new front apron design and a low front splitter. The tail lights are encased in smoked glass and much of the trim is in gloss and matte black. Even the roof hoop on the Targa is finished in black (a first for a production 911). Inside, the stopwatch that used to sit atop the dashboard is integrated into the major instrument cluster and there’s a comprehensive pack of digital systems for recording performance and lap times, all of which work with the Porsche Track Precision smartphone app. The Alcantara seats offer better support and comfort thanks to four-way electrical adjustment. For those that just want speed, then the Carrera 4 GTS hardtop coupé will be the model of choice. Those that want a little 911 purity to cancel out the turbocharging can plump for the Carrera GTS (rear-wheel drive only). And those that want speed and style can pick from two soft-top models (with or without four-wheel drive) or the four-wheel drive targa complete with its trick folding roof panel. Order books are open now and the first deliveries will start in March. Prices before options will range from €124,451 for the Carrera GTS to €144,919 for the Targa 4 GTS.